How many times that you have gotten an eye infection because you have rubbed your eyes with your fingertips? Have you ever given in to the overwhelming urge to rub your itchy eyes only to get conjunctivitis later? Or red or swollen eye? If you ever suddenly feel that your eye itches so bad that you must, must rub it, the more the itch- the more likely you will get an eye infection from doing that. Please don’t fall into the trap and rub the itch… else you will really regret it later. Instead, you have to let go of that overwhelming urge and instead dash to the washroom, clean your hands well and use it to cup water to your eyes. Put your eye into the cupped hand filled with water and blink a few times. It is always good to have medicated eye drops handy- I find that after putting some eye drops (those meant for inflamed eye). the act of typing on your keyboard- I read a recent article in MSN- it is said that at least the toilet is cleaned everyday using detergents but …do we actually clean our keyboards? It is especially worse if we share our PC/laptop with others. have you ever scratch an itch in your body and then rub your eyes? Then just about 2 weeks ago, again I woke up with an unbearable itch- rubbed my eyes and ended up having it swollen. Fortunately it was not conjunctivitis but the condition looks worrying enough. I dropped by a pharmacy on the way to work and purchased some eye drops. After putting it in my eye, and also going to the washroom to rinse my eyes with water (after scrubbing my hands clean), my eyes were back to normal after 3 or 4 hours. This has taught me a valuable lesson to try not to rub my eyes using my fingertips. You should not too – especially so if you are wearing contact lenses. If you really really must rub your eyes, you can train yourself using the back of your hands or use the knuckle for a gentle rub. This is because the back of the hands, unlike the fingertips is not so heavily populated by bacteria. 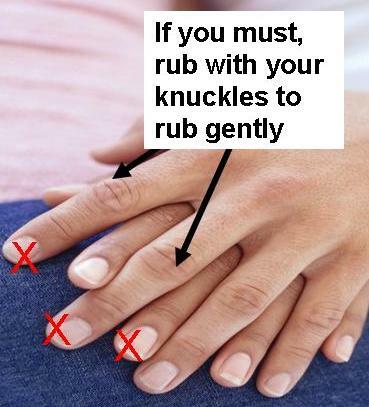 It is not to say that you should rub your eyes all the time when the urge hits you- but if you normally use the back of your hands/knuckles, then when you mindlessly rub your eye the next time it itches, you will automatically use the back of the hands or knuckles. Years ago I visited an eye doctor who told me that if the eye itches often, it could be allergic to something. She said as much as we can, we should always resist the urge to rub the eye. This is especially important if we are wearing contact lenses- because the contact lenses will rub and may cut through our corneas. There are cases of people who constantly rub their eyes so hard that they got blinded because the outer membrane covering the eyes got dislodged from its original position. Remember, our eyes are really delicate. Therefore, keep eye drops in handy (but change the bottle after every 2 or 3 months) and use water instead of rubbing the eye with your hands. Update: March 2012: Video advert by Eyemo that I managed to find in YouTube- that visually illustrates why it is bad to rub your eye. The video is in Bahasa language- but you can see from the graphics that clearly illustrate how when you rub your eyes, the dust and particles just got rubbed more in- and in severe cases, it can dislodge the cornea, making a person blind. I can feel my eyes itch right now and none of my remedies work. Even my medics don’t help!